Looking for the best Khao Lak restaurant recommendations? You’ve come to the right place. As in the rest of the country, food in Khao Lak is characterized by its freshness and variety. The food is rich in vitamins since the cooking time for each dish is relatively short, thus making Thai food not only delicious but also very healthy. Khao Lak is right on the sea so its natural that seafood and fish are some of the key ingredients in Khao Lak’s food. Set by the sea, this cozy beachfront restaurant offers a wide array of Thai food at a reasonable price without sacrificing on quality. The menu is focused on spicy curries, fish and seafood dishes. Be sure to try the papaya or pineapple salad while you’re here. Tip: Krua Thai is perfect for a romantic dinner at sunset. The Siam Turmeric is a real gem! At first glance, the rustic and simple decor may mislead you into thinking it an ordinary restaurant, but don’t be fooled! This eatery offers absolutely delicious Thai and Indian dishes – homemade and with zero additives! Even vegetarians are completely satisfied with the wide variety of dishes on the menu. The icing on the cake however, is the delicious and inexpensive cocktails. Tip: We recommend the meat dishes from grill – juicy and perfectly cooked to your taste! Dive in, relax and enjoy – Khao Lak is a beautiful island paradise. Discover the culinary hotspots of the charming coastal city – your personal Travel Consultant will be happy to recommend the best Khao Lak restaurants to suit your tastes. Naturally, we’ll reserve a table for you! 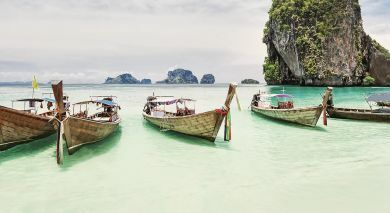 Your Enchanting Travels team will take care of every detail so that you can sit back, relax and enjoy your tailor-made tour of Thailand beaches.